Because no two patients are precisely alike, it’s important that every person receives care that’s custom-tailored to their unique needs. If you’ve received cookie-cutter chiropractic in the past, rest assured that you won’t get that here. The care we offer not only can get you out of pain but on the path to living your best life. I had a wonderful first visit. I was standing taller the minuet I left there. I would recommend this practice to my family and friends. I couldn’t be more satisfied with the experience. Dr. Swedberg is so knowledgeable and takes time to listen and really figure out how to help you feel your best. My whole experience was warm and welcoming!! Thanks so much for your help correcting my insurance error! Clean caring comfortable professional first visit. Great first time experience from the moment I walked in to the moment I left. I am very hopeful and optimistic that Dr. Swedberg can help me. You all took the time to understand, & you seemed to really care. I felt comfortable from the get go. Thank you! Great adjustment, and really enjoyed the pre-adjustment massage table during my short wait. I was impressed by what I learned about my body and how the right chiropractor can help it. My initial visit was very thorough and encouraging. Dr. Swedberg seems like a terrific chiropractor!! I’ve had two follow up sessions and plan to reschedule more. Looking forward to keeping my body feeling good with routine alignment and adjustments! Really appreciated the comprehensive assessment and the explanation of everything! Probably the best chiropractor I’ve ever seen. Excellent. I absolutely love coming here!! Friendly staff and the Doc is the best!! Attention to detail and addressing/fixing my issues well done and appreciated. Probably best chiropractor we’ve ever been to! Very thorough! I felt heard when Dr. Swedberg was listening to my concerns. He knows the human body well & how to promote its healing. Valerie is so sweet & helpful. I enjoy my experience. Great person, helpful, and attentive. It has been over 12 years of pain and stiffness and after one visit I could do things that I haven’t been able to since my accident. I have been to PT 7 times and did not have the results I obtained from just one visit here! I am excited to see what each visit holds and am so incredibly grateful to gain my mobility back! Amazing results, amazing doc & amazing staff! I appreciated being seen the day I called. After two visits, I felt significantly better! I’m looking forward to my body working right. I love the massage tables!! Doctor and staff were GREAT! Very professional and nice atmosphere!! We’re very happy to have found you!!! I feel instant relief! I cannot wait to go back next week for my followup! If you’ve been searching for a safe, drug-free and effective way to enjoy better health, we invite you to experience the incredible benefits of chiropractic care at Body Balance Chiropractic. 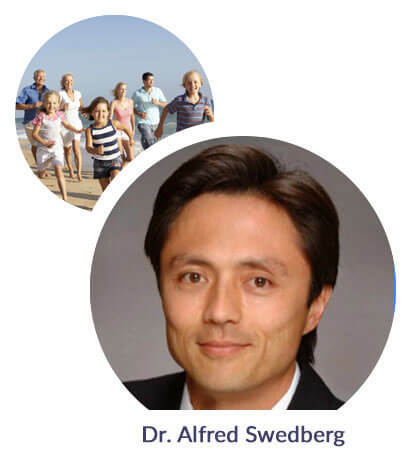 Albuquerque Chiropractor Dr. Alfred Swedberg is passionate about helping patients of all ages feel their best, naturally. Whether you’re a weekend warrior, professional athlete or member of an active sports family, we look forward to helping you perform at your best and enjoy a greater sense of well-being. When your spine is functioning at its peak through chiropractic care, you’ll be equipped to take on the various activities and sports in life that you love. We offer a variety of chiropractic techniques, including low force, instrument ones that get you excellent results. Pulsed Energy is another tool in our toolbox that promotes healing of acute and chronic conditions. At every visit, Dr. Swedberg will check you and determine what needs to be adjusted. We are confident that you’ll experience positive changes after each chiropractic session with us. Get on the path to optimal health and wellness at Body Balance Chiropractic. Book an appointment today with our Chiropractor Albuquerque Dr. Swedberg!